COMPATIBLE WITH DIVI thru v.3.15 – NOTE: modules in this plugin are fully compatible in Page Builder (Backend Builder) and are partially compatible in the Visual Builder. Modules can be added and edited in VB and are rendered via ajax and thus may take longer than ET modules. Future versions of KK Divi Blogger will be fully compatible with the VB when applicable and will enable full editing capabilities. NEW IN v.0.1.3 – added the ET HashChange navigation capability to all Tabs and Toggles. See the discussion and examples in the HashChange tutorial page at the demo site. KK TABS and TOGGLES includes four modules for use within the Divi theme by Elegant Themes. Except for the KK/TT Vertical Tabs module, the KK/TT Horizontal Tabs, KK Toggle Ext and KK Accordion Ext modules are similar in scope to the Divi Theme versions. All four of these modules have an interface that allows selection of Divi Library items to include as content within the tabbed area. This in addition to the usual content provided through the theme’s tiny-mce editor. The Tabs modules differ also in that you may include a font icon or image within the Tabs in addition to the usual title text. 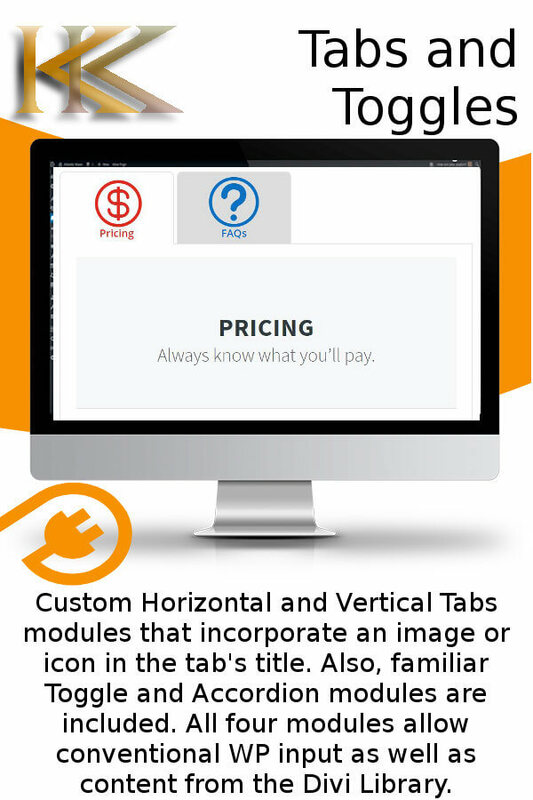 You can have both icon/image and text OR icon/image/text alone to identify tabs with their content. There is a full assortment of controls within the module settings to style not only the Tabs but the content as well. The best way to explain how these modules can be used is to visit the Demo/Tutorial site. You may use on all sites (personal and commercial) that you build as often as you like. You may not transfer ownership of your license or provide to others. Support will require valid purchase ID or license key. Purchase price provides six months of support and lifetime updates.